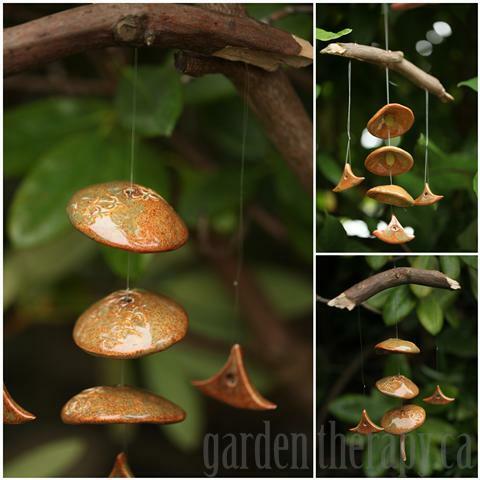 Organic clay shapes strung up on branches make for beautiful art that brings melody and movement to the garden. 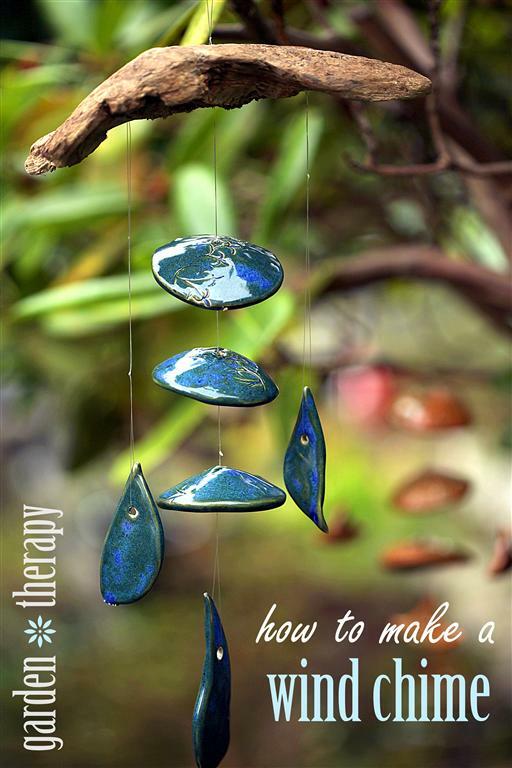 Follow my instructions to make your own elegant wind chime. 1. Pick Your Pendants and Drill a Hole in Each One. 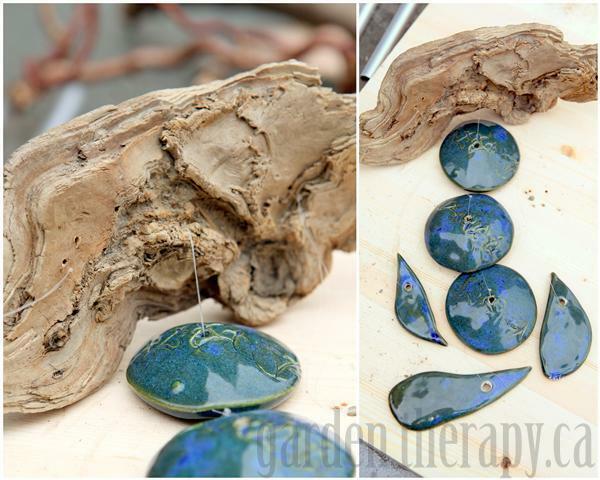 Collect clay pendants or pieces, or make your own with a modeling clay that can be baked at home in the oven. I made these shapes at a pottery studio, and if you have access to one as well, the possibilities are endless. You could also use shells or beach glass for this project. Make holes in those by covering the area you want to drill with a piece of masking tape, then using a fine bit to drill the hole. Be sure to let the drill do the work (read: don’t push too hard) or you could break the shell/glass. 2. 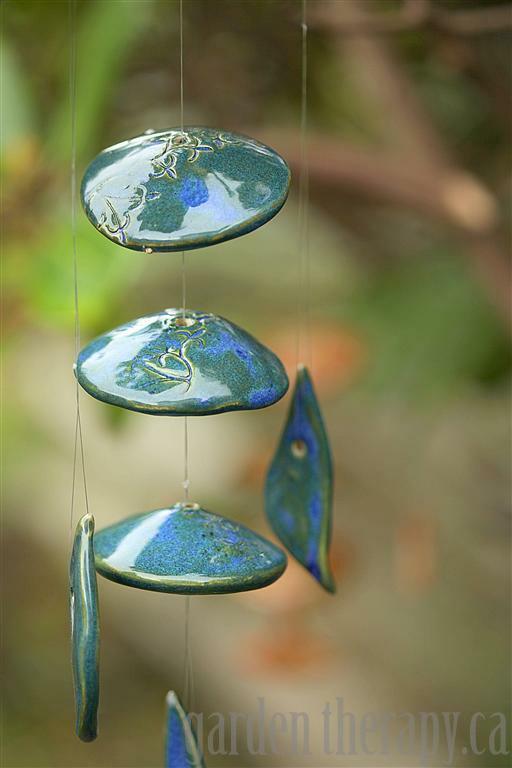 Make the Top of Your Wind Chime. 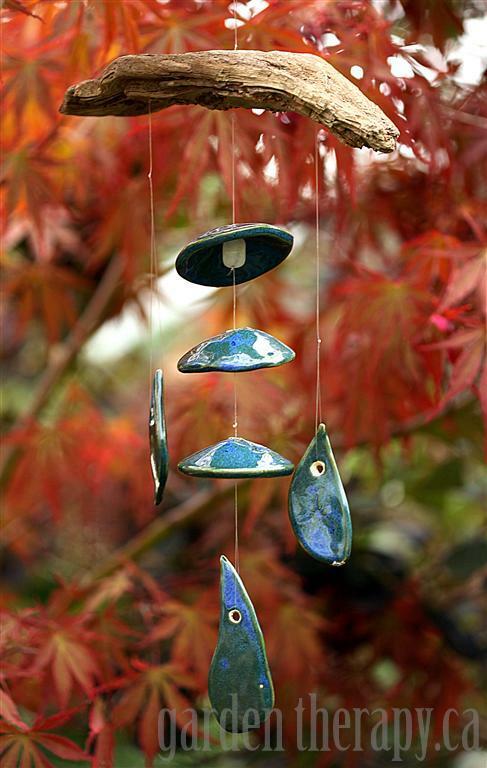 Drill holes in the branch or wood that you have chosen to top the wind chime. Make 2 holes in the center, and two on either side. This is where you will thread and tie your fishing line through. 3. Thread Your Line and Add Clay Pieces. Thread the first of the clay pieces on the fishing line and tie a knot just above it. 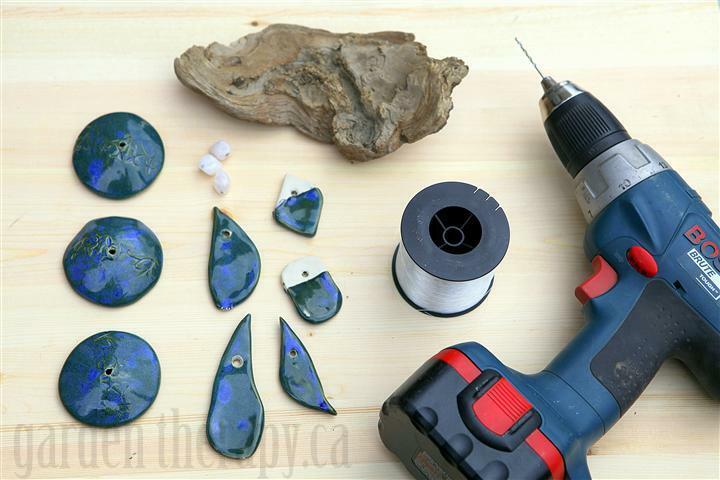 If you are using pieces with larger holes, use beads to hold them in place. 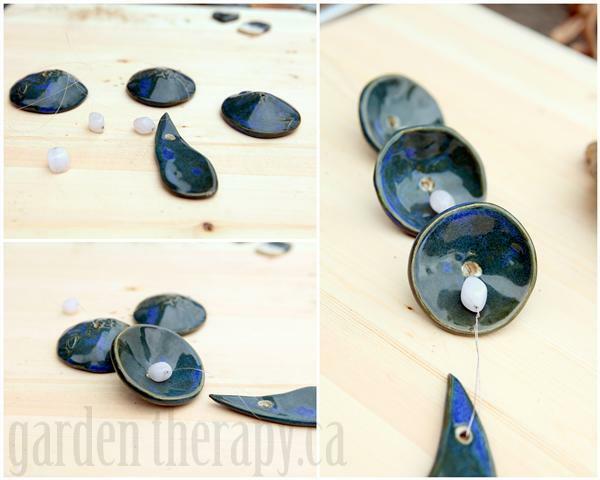 Tie a knot where you want the bead to sit, thread on the bead and top with the clay shape. Continue to thread 3-5 items onto the fishing line – this will be your center piece. 4. Tie Ends Together for a Hanging Loop. Now put one end of the fishing line through one of the center holes and put the other end of the line through the second hole. Tie them together tightly, leaving 2 inches above the knot. Tie the top ends together with a few knots-this will be your hanging loop. 5. Add Pieces to the Side. 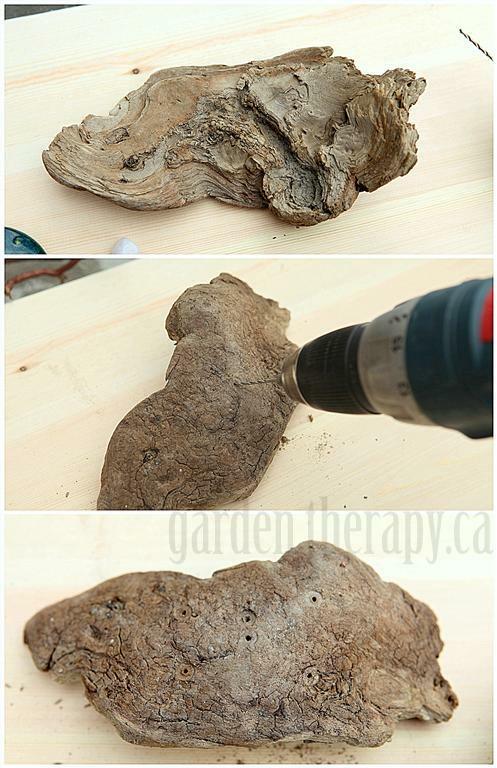 Add 2 or more clay pieces to the sides by looping them through a length of fishing line and tying them off through the two holes in the top sides of the wood. Measuring the spacing between the clay pieces is all based on what you are using and preference. Lay them out and mark where you want them to fall. Spacing should be close enough that they will clink together with a breeze, but not so close that they get tangled up. 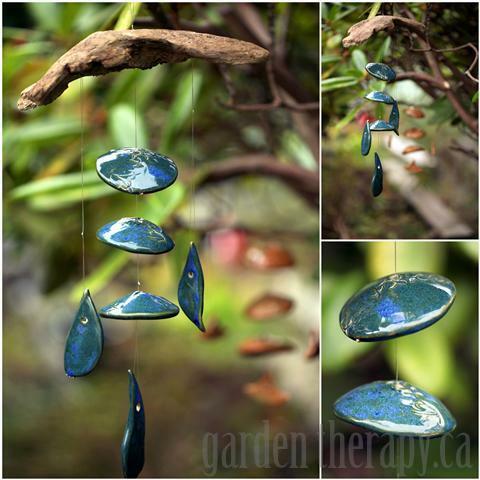 Hang your wind chime on trees with contrasting foliage for a striking look that highlights a feature in the garden. 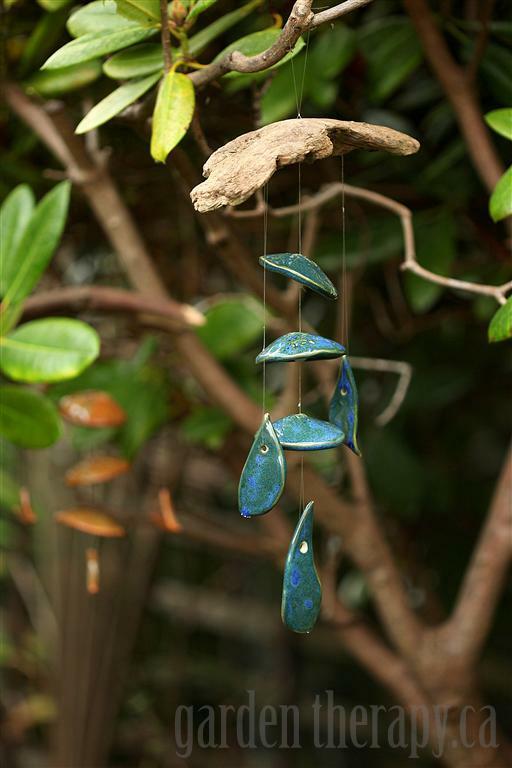 I made a second wind chime with a bamboo glaze that stands out well with the deep green leaves and thick branches of a Rhododendron. Thanks for visiting weekend project #50. Only two more and we will have made a tutorial for a fabulous garden project every weekend for a year! Never fear, the weekend projects and all the other crafty–foody–gardeny goodness will keep on coming. Check out more ideas by clicking through the tabs just below the header. « Mason Jar Ice Cream Cake, Oh Yeah! Simply stunning! It looks like your clay pieces are completely glazed. If so, I can’t figure out how you have done it without them sticking to the kiln during firing. Any suggestions are appreciated. Hi Heather, yes, they were glazed all around. I dipped them in glaze and then set them on stands in the kiln. The stands are made of clay pieces with a few thin nails set into them. I set them on the nails where you won’t see the tiny pin holes they leave behind. I hope that helps! Hi Sarah, I never thought about that. Really, I just used some fishing line that I bought at a craft store. It has lasted 4 years in the garden so far without breaking. It doesn’t get nearly as hot here in Vancouver, BC, though.